Dr Ismail Kalule is ecorted by prison officers in the past. He was granted bail but rearrested before he could leave court premises which has caused the law fraternity to speak out in protest. KAMPALA. Lawyers want the High Court to summon Inspector General of Police John Martins Okoth-Ochola to explain why his officers re-arrested a suspect who is facing charges of plotting to overthrow the government. 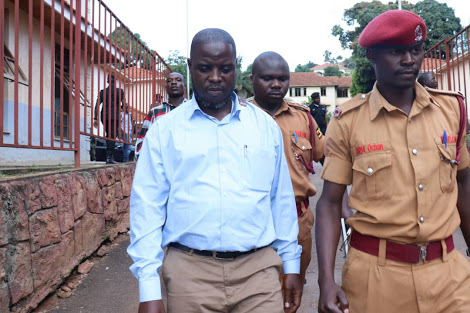 Dr Ismail Kalule was last week granted bail by the International Crimes Division of the High Court but immediately re-arrested by security personnel. And Dr Kalule’s lawyer, Mr Evans Ochieng, said security personnel are yet to explain why his client was arrested. “We are planning to move court to summon the Inspector General of police to show cause why our client was re-arrested because no fresh charges have been brought against him as required by law. It is an act of impunity,” Mr Ochieng said in Kampala yesterday. Dr Kalule is part of the group re-arrested in 2016 by armed security personnel soon after they were cleared of wrongdoing in regard to their involvement in the 2010 twin bombing of the Ethiopian Restaurant in Makindye Division and Lugogo Rugby Grounds in Kampala, which claimed 76 lives. While releasing the suspect last week, Justice Moses Mukiibi warned security organs against disrespecting court orders. “As different players execute their functions, they should have clear vision and observance of Constitutional provisions and the law. No organ should exercise too much power in total disregard of the roles of other organs,” held Justice Mukiibi. “It is not only bad or uniformed officers in security organs who can flagrantly disrespect court orders. We should all bow our heads to the governance of the rule of law,” he added. However, armed security personnel, who had surrounded the court premises, later re-arrested Dr Kalule and whisked him off to an unknown destination.